I’ve been struggling with hobby motivation a lot over the last couple of months. I’ve had a lot going on with getting my house sorted and whatnot, which has undoubtedly not helped, but even so, I don’t think I’ve managed to properly finish any single miniature so far in 2018. Which is, itself, disheartening. I’ve had several projects going on, as well, which also aren’t really helping with my motivation: Tyranids, Genestealer Cults, Dark Eldar Wych Cults, and then re-starting with my Necrons – it’s all been rather a lot, I feel! Aside from the difficulty I’ve experienced with trying to decide what to focus on, I’ve found that I’ve lost a bit of skill with painting, having not really done a great deal for so long. This was abundantly obvious when trying to paint the Neophyte Hybrids for my Genestealer Cult, where the amount of detail on the regular troops was just insane. So I began to cast around for other things to paint, while I built myself back up to all that. And then I decided to jump on board with Tau. Now, I’m not about to launch into some grand tale about how I’ve always wanted a Tau force. I’ve never really considered them before, as I’ve always just been drawn to other xenos races. I know very little of their lore, beyond the usual stuff about space communists, and I only know that they’re a sit-back-and-shoot style of army. But I think that new-ness, for me, is what has ultimately led to me getting into them as a force. Back in 2015, I painted up a single Tau miniature for a painting competition at my local GW, and I remember it being just so arduous due to the fact that the models were so small. Well, I’d not been painting for a very long time back then, so I suppose I’m more “into it” these days. Despite what I said earlier about feeling out of practice with painting minis, I feel like I’m up for the challenge, at any rate! So I’ve gone pretty extensively in on Tau, ready for the new Codex to drop in a week or so’s time. I suppose that can also be a factor here, having something new to look forward to and all the rest of it. While part of me wants to rebel at the notion of jumping on any bandwagon, I think sometimes it’s fine to see something new, like the look of it, and get on board with it, you know? Anyway… enough trying to justify my decision, I think! 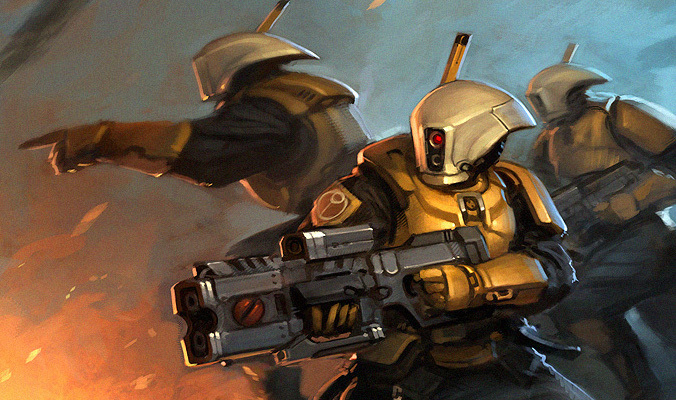 I’m going to try my best to chronicle my adventures with the Tau on this here blog, and see how things pan out as I build, paint and play with the new army. I’m still not entirely sure on my colour scheme – not knowing any of the lore is both a good and a bad thing here, as I don’t know what to do for the best! But for now, I’m focusing on building up the contents of the Start Collecting box, and trying to get all of that sorted. I want to do this almost as a Tale of Four Warlords style of monthly updates, but as I’m starting from behind I’ve decided for the first goal to have both the Start Collecting box and one other (probably a Commander) built and painted by the end of April. That should give me enough time to not only get the building and painting done, but also to get to grips with the lore and the army on a more cohesive scale. It is a good time to get on some Tau so good call!